I thought I should touch on that. Wouldn’t that be fun? First of all, I have a bachelor’s degree in music education. Yep, I was a music major – hours of practicing, recitals, conducting lessons, ensembles (like marching band, as I mentioned before) – that was college for me! And after graduating, I took a job in a small town as an elementary music teacher. There I am in my early teaching days. 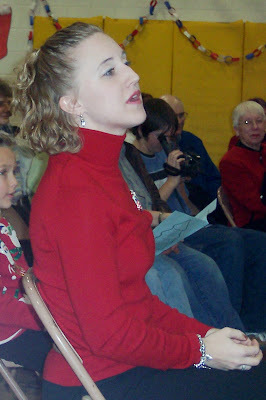 Directing a Christmas program. Every year, we invited veterans and military men and women from the community to attend and honored them with song. It was one of my favorite parts of my job. The gratitude and pride those men and women exhibited was enough to make me cry EVERY time. So cool. I don’t think I could teach high school students, but I LOVED working with them on the musical. We always had a blast. 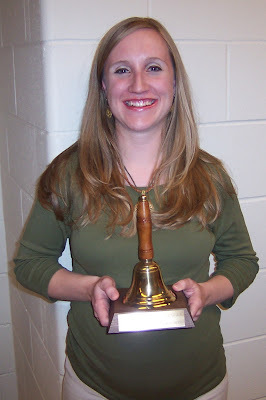 So what else filled my time as an elementary music teacher? And organizing the elementary talent show, coaching some junior high volleyball and teaching piano lessons here and there, just to name a few other things. But that was part of teaching in this small town and I LOVED it there. The town, school district and community hold a very special place in my heart. I was spoiled with fantastic administration, wonderful teachers around me and very supportive and involved parents. When I decided to stay home, I had people asking if I had received a better offer from another school district. I told them that was impossible. Sure, I could have gotten more money and less responsibilities somewhere else. But I can’t imagine myself teaching in any better place than where I was. I am fortunate enough to substitute in this district every once in a while and be reminded of what a great place it is.